A climber with a number of names Podranea ricasoliana, is also known as Bignonia ricasoliana and the ‘Pink Trumpet Vine. 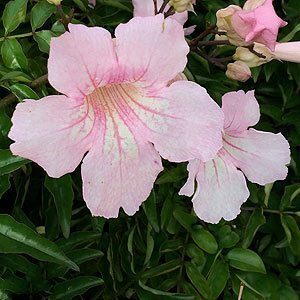 Grown for masses of pink flowers that appear from spring to late summer depending on the climate. 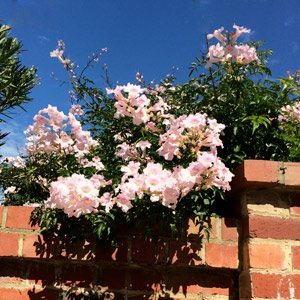 This evergreen fast growing climbing plant is originally from south Africa, and although it does like a warm sunny position it is a home as far south as Melbourne. With large pink flowers, trumpet shaped and looking a little like a giant foxglove this is a long flowering plant, masses of blooms from spring through to late summer or early autumn. Also known as Port St Johns creeper, it is widely grown in tropical and temperate climates around the world. It can climb to over 10 metres in height in ideal conditions, however it is easily pruned to size. Best planted where the root system can be in a cool shaded position and the vine itself be allowed to climb into the sun. Prepare the soil by digging good amounts of well rotted compost and cow manure. Plant and water in well with a liquid seaweed fertiliser. Easy from cuttings taken in summer or by layering, also grows well from seed. Plants are readily available from good nurseries and garden centres in summer. You can search for and find a huge range of plants both common and rare using our specialist nursery index. In warmer climates this climber can be a little invasive. It will strike very easily from pruning left on the ground. it will also self seed.